My parents are people who go to timeshare presentations for the free stuff and never fall for the pitch. They have always told me that buying a timeshare at these sales events is a bad idea because of the inflated upfront cost and perpetual maintenance and exchange fees the timeshare companies pile on. It is also quite difficult to sell a timeshare you no longer want because there is usually a giant supply of timeshares on the market. If you do want to get rid of a money sucking timeshare, donating it may be the most economical option. When you donate your timeshare, you can write off the value of the timeshare on your taxes and get a tax deduction. This detailed FAQ at Donate for a Cause describes the process. It is up to you to decide the fair value of your property and you will be free from that unwanted timeshare without too many worries. You do need to be able to itemize to take advantage of donations and you should check the IRS's rules about non-cash donations. Currently any non-cash donation worth over $5000 need to be verified with a written appraisal. It is not always true that the tax deduction you receive will be greater than the price you can get for a timeshare on the open market. This really depends on your tax rate and the value of your timeshare, but you definitely save quite a bit of time and energy by just giving the property away. The cost of marketing your timeshare can be quite high because there is so much competition on the market. If you hire a company that helps you list your timeshare, you are usually required to pay a upfront fee that could be quite high. Generally the companies that work for a flat fee do not care how much your timeshare sells for and there are many listings on eBay that are put out by these companies that unload timeshares for as low as a dollar. Finally, another bonus to donating your unwanted timeshare is that you will be helping someone in need. It is truly a win win situation for everyone involved. The charity gets cash to help people, the buyer of your timeshare gets a discount, and you will no longer have to deal with maintenance fees. If you are not sure where to start, Donate for a Cause is a charity specializing in timeshares and they contribute to a variety of charities. It is also possible that your favorite charities accept timeshares as donations and you can find out by calling or checking out their websites. I'm all for helping charities but rather than walk away from your timeshare with only a small tax dedection, people would be better off by learning how to use it correctly. The number one reason quoted for buying a timeshare is to be able to exchange it. Ironically, the number one reason quoted for wanting to sell a timeshare is frustration with the exchange process. I've done nearly 50 timeshare exchanges in 17 years, the last one to the Westin on Kaanapali Beach in Maui. If I had to pay for the 1 bedroom out of my pocket I would have been out $600/night. Because I've discovered how to work the exchange system, I only paid $129 for the entire week. Yes, I had to pay my maintenance fee of $600/year but altogether this added up to about one night,s stay. Timeshare like anything else, work well if you know how to use them properly. So don't blame the timeshare for not working but the timeshare owner for not learning how to use it properly. Unfortunately many times it isn't as easy as it seems to get rid of an unwanted timeshare. The charities aren't accepting every timeshare they are presented with, as some of them aren't worth the maintenance fees which are charged. There are a growing number of companies that are actually charging people thousands of dollars to take timeshares off their hands. NuWire did an article about how timeshares are horrible investments, that is certainly worth reading. My advice to anyone is DO NOT EVER purchase a timeshare. And the kicker is that after you have pumped all this money into the timeshare you have no way of getting out of it. If only it was this easy. Donation companies usually only take the timeshares that aren't absolutely terrible. Also, you must be up to date on your maintenance fees, AND have your timeshare mortgage completely paid off if you want to donate. 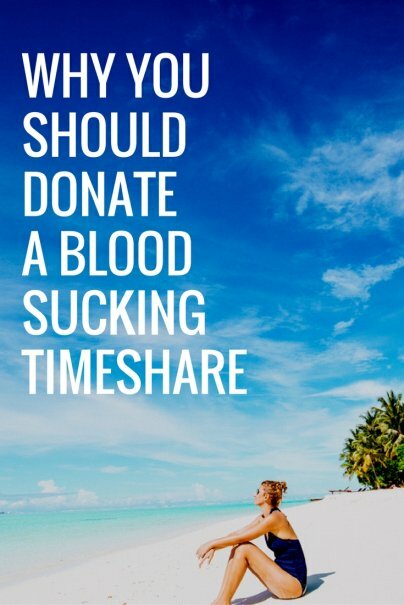 If you can donate, it's a great way to get rid of an unwanted timeshare, but don't count on it.